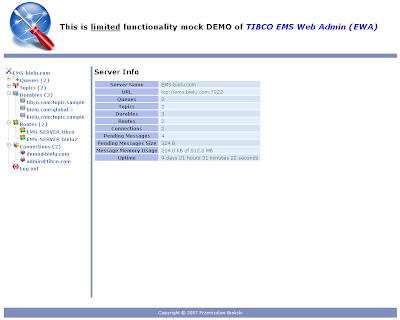 Bored and tired with console-based TIBCO EMS admin? This is my system that I developed in few days after struggling with console-based EMS admin. If you like it and would like to use it let me know. Do you think such system would be useful for TIBCO EMS developers/admins? This is neat. How can I get this tool? Pretty cool stuff ! !